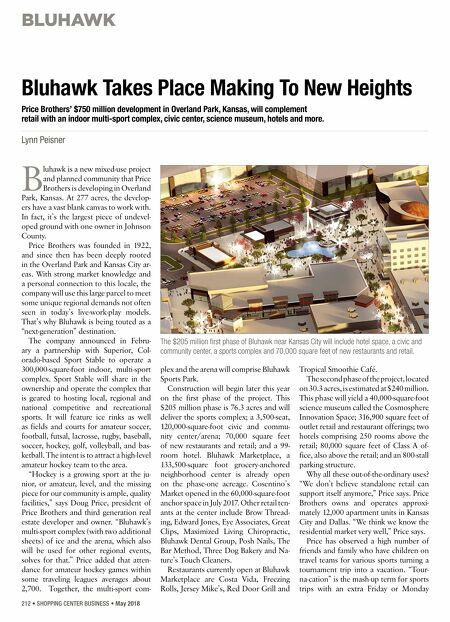 BLUHAWK 212 • SHOPPING CENTER BUSINESS • May 2018 B luhawk is a new mixed-use project and planned community that Price Brothers is developing in Overland Park, Kansas. At 277 acres, the develop- ers have a vast blank canvas to work with. In fact, it's the largest piece of undevel- oped ground with one owner in Johnson County. Price Brothers was founded in 1922, and since then has been deeply rooted in the Overland Park and Kansas City ar- eas. With strong market knowledge and a personal connection to this locale, the company will use this large parcel to meet some unique regional demands not often seen in today's live-work-play models. That's why Bluhawk is being touted as a "next-generation" destination. The company announced in Febru- ary a partnership with Superior, Col- orado-based Sport Stable to operate a 300,000-square-foot indoor, multi-sport complex. Sport Stable will share in the ownership and operate the complex that is geared to hosting local, regional and national competitive and recreational sports. It will feature ice rinks as well as fields and courts for amateur soccer, football, futsal, lacrosse, rugby, baseball, soccer, hockey, golf, volleyball, and bas- ketball. The intent is to attract a high-level amateur hockey team to the area. "Hockey is a growing sport at the ju- nior, or amateur, level, and the missing piece for our community is ample, quality facilities," says Doug Price, president of Price Brothers and third generation real estate developer and owner. "Bluhawk's multi-sport complex (with two additional sheets) of ice and the arena, which also will be used for other regional events, solves for that." Price added that atten- dance for amateur hockey games within some traveling leagues averages about 2,700. Together, the multi-sport com- plex and the arena will comprise Bluhawk Sports Park. Construction will begin later this year on the first phase of the project. This $205 million phase is 76.3 acres and will deliver the sports complex; a 3,500-seat, 120,000-square-foot civic and commu- nity center/arena; 70,000 square feet of new restaurants and retail; and a 99- room hotel. Bluhawk Marketplace, a 133,500-square foot grocery-anchored neighborhood center is already open on the phase-one acreage. Cosentino's Market opened in the 60,000-square-foot anchor space in July 2017. 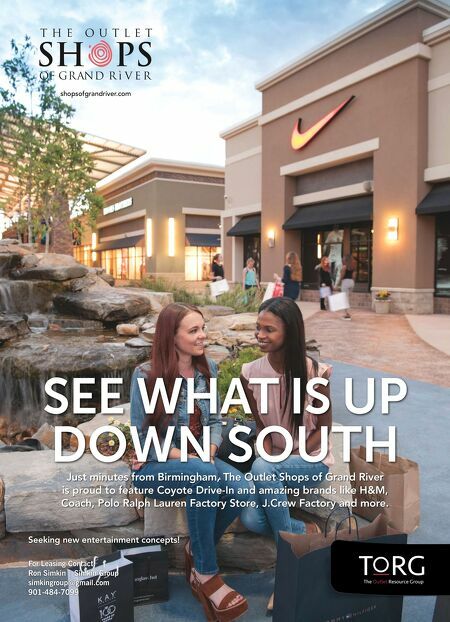 Other retail ten- ants at the center include Brow Thread- ing, Edward Jones, Eye Associates, Great Clips, Maximized Living Chiropractic, Bluhawk Dental Group, Posh Nails, The Bar Method, Three Dog Bakery and Na- ture's Touch Cleaners. Restaurants currently open at Bluhawk Marketplace are Costa Vida, Freezing Rolls, Jersey Mike's, Red Door Grill and Tropical Smoothie Café. The second phase of the project, located on 30.3 acres, is estimated at $240 million. This phase will yield a 40,000-square-foot science museum called the Cosmosphere Innovation Space; 316,900 square feet of outlet retail and restaurant offerings; two hotels comprising 250 rooms above the retail; 80,000 square feet of Class A of- fice, also above the retail; and an 800-stall parking structure. Why all these out-of-the-ordinary uses? "We don't believe standalone retail can support itself anymore," Price says. Price Brothers owns and operates approxi- mately 12,000 apartment units in Kansas City and Dallas. "We think we know the residential market very well," Price says. Price has observed a high number of friends and family who have children on travel teams for various sports turning a tournament trip into a vacation. "Tour- na-cation" is the mash-up term for sports trips with an extra Friday or Monday Bluhawk Takes Place Making To New Heights Price Brothers' $750 million development in Overland Park, Kansas, will complement retail with an indoor multi-sport complex, civic center, science museum, hotels and more. Lynn Peisner The $205 million first phase of Bluhawk near Kansas City will include hotel space, a civic and community center, a sports complex and 70,000 square feet of new restaurants and retail.